General Purna Chandra Thapa, ndc, psc, MSS, an alumnus of the Nepali Military Academy was commissioned into the Nepali Army and joined Gorakh Bahadur Battalion in December 1980. 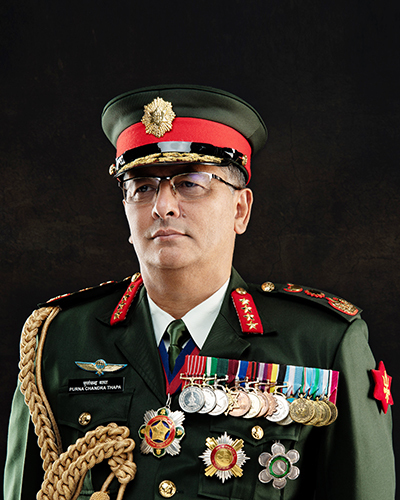 He assumed the command of the Nepali Army as Chief of the Army Staff on 9 September 2018. The General has had an illustrious career with outstanding performance on all the courses he attended. He is a graduate of National Defence College, India and Army Command and Staff College, Nepal. Besides holding Bachelors Degree from Tribhuwan University (Nepal), he also holds a Master Degree in Defense and Strategic Studies from the University of Madras (India). During his distinguished military career spanning over 39 years, the General has held various high profile command, staff and instructional appointments. He has commanded an Infantry Battalion, an Infantry Brigade and has served as General Officer Commanding (GOC), Valley Division.Besides his important staff appointments at Army Headquarters as Military Secretary(MS), Director of the Directorate of Welfare Planning(DWP), Adjutant General (AG) and Master General of Ordnance (MGO), General has also held the coveted appointment of the Chief of Staff (COS) and the Chief of the General Staff (CGS) from 2015 to 2017. As CGS, he has also served as Officiating Chief of Army Staff on five different occasions. His other important assignments includes tenures in the Office of Principal Military Secretariat (PMS)and as Directing Staff at the Nepali Army War College (NAWC). The General Officer’s prestigious overseas appointments includes Head of Mission, Force Commander and Designated Official of United Nations Disengagement Observer Force (UNDOF), Golan Heights in 2015/16. He has also served twice in United Nations Interim Force in Lebanon (UNIFIL), Lebanon in 1986 and 1989 and in United Nations Protection Force (UNPROFOR), Former Yugoslavia in 1994/95.He has also participated in various high level seminars, workshops and military exercises at home and abroad. Beside these the General's one of the high profile appointment had been the appointment of co-vice Chairman of Joint Monitoring and Coordination Committee (JMCC) representing the Government of Nepal and the Nepali Army in United Nations Mission in Nepal (UNMIN) from 2009-2011. General Thapa has been decorated with the prestigious "SUKIRTIMAYA RASTRADEEP", "SUPRABALJANASEWA SHREE", "PRAKHYAT TRISHAKTIPATTA", "SUPRABAL GORKHADAKSHINBAHU" and "PRABAL GORKHA DAKSHINBAHU" for his meritorious services in the Army. He has earned himself a reputation of being a determined& pragmatic commander firmly dedicated towards his profession and institution. The General Officer has the legacy of serving for generations in the Nepali Army and he is the youngest son of Lt Col Phanendra Bahadur Thapa (Retd) and Mrs Sabitri Thapa. A native of Lamjung, General Thapa is married to Mrs Deepa and the couple is blessed with daughter Ruru and son Raunak. The General is an avid cyclist and his hobbies include sightseeing and trekking.